Recently I read an account in the New York Times of some LDS missionaries in Uganda, a location chosen, no doubt, because that country is the setting for the fictional The Book of Mormon: The Musical. The article dutifully explained the basics of the missionary program, describing it as a “well-oiled operation” that sends young men and women in pairs out into the world to share the Mormon gospel. What followed was a predictable story arc involving the sacrifices young missionaries make, their daily schedule, the “temptations” they face, and their simple faith. One missionary said, “I have learned more about myself in the last 20 months than I could if I was back home. You begin to understand what really matters in your life” (Kron, Josh, “At Age 19, From Utah to Uganda,” New York Times, 12 April 2012). Many other similar articles about missionaries have appeared in local papers in the United States and elsewhere, thanks to the efforts of LDS regional and stake public-affairs representatives. But the third missionary gave anything but the standard story. “This country [Bolivia] basically hates me,” he said, describing Bolivia as a place where children throw rocks at missionaries and people call the elders “huevos” (slang for “testicles”): “If I’d stayed in America, I wouldn’t have played pro football. Before, I just did it because I was good at it. Now I know I love football. Now I know what’s important. Before, I had trouble tackling; that was my only real weakness. Now I’ll just go home and pretend every offensive player is a Bolivian calling me a huevo” (Smith, Gary, “A Season For Spreading The Faith,” Sports Illustrated, 4 Sept. 1985). But it was easy to keep spinning mission accounts into uplifting stories of faith and overcoming trials, whether in my “homecoming” talk or when people asked me about what Bolivia had been like. I began to see my mission wholly through my rose-colored rear-view mirror. And then some three years after my return, my new bride and I were sitting in a restaurant when we heard over the radio that two LDS missionaries had been murdered in Bolivia. I felt as if all the air had been sucked out of the room, and I couldn’t speak. Over the following three days I couldn’t sleep or eat, as feelings and memories I had not allowed myself to think about came flooding out of me. I was alternatively heartbroken and enraged, as I remembered every hurt, every blow to my soul, from my mission. And then it was gone again, and life went on as before. Nearly twenty years later, I told a friend about a strange experience I’d had on a bridge late one night in La Paz, and he suggested that I write it down. I did, and then I couldn’t stop writing for another five weeks or so, until I had written out everything that happened to me in Bolivia, the good, the bad, and everything in between. Eventually a friend convinced me to try and publish it as a book, but I held back for three years because of family pressure; despite my efforts to stick to what actually happened on my mission, I was told the book was “too negative” and was “airing the church’s dirty laundry.” For reasons I don’t quite understand, I finally published the book in 2011. Immediately after the book went out, several friends from my mission told me how much the book had shaken them. One said he had cried all the way through it because it had brought out emotions and feelings he had long since suppressed (I wasn’t going for crying). Other readers said that the book had affected them profoundly as well, as they had never been able to talk about their missions as they experienced them. Does this mean that missions are terrible, traumatic experiences? No, of course not, but it may suggest that many of us are filtering out and suppressing everything except the positive and faith-promoting in what might be called a sin of omission. The experiences we filter out may be mundane and totally innocuous, but if they do not fit the standard narrative or cannot be spun into it, they are ignored and even forgotten. There are two primary reasons missionaries are less than candid about their experiences: first, many missionaries are explicitly told to do so; and second, missionaries self-censor for a number of reasons. This was the rule in my mission: Should you write home about any negative experience and have a family member call the office to check up on you, you would find yourself in the [mission] president’s office real fast. Every letter home was to be a faith-promoting letter. The reasoning was [that] your family wouldn’t worry about you and flood the office with phone calls about your well-being, wasting the president’s valuable time. When I entered the MTC in January 1994, the MTC president and his spouse told us during the orientation meeting that we should never write home about negative aspects of our mission–we should always keep it positive. I still remember her saying, “The bad experiences will outnumber the good, but the good will outweigh the bad.” My mission president in France provided similar instruction. Knowlton’s candor was apparently not appreciated in Salt Lake, as it eventually cost him his position at BYU. Most missionaries will never face that kind of pressure, but stronger push for censorship seems to come from within the missionaries themselves. [Our mission president] told me to please not say negative things about Bolivia when I got home because he kept getting panicked calls from parents when their kids would get their calls to Bolivia. I was kind of embarrassed by the request because he was basically asking me to lie. After his return home, he was asked to give a presentation about his mission to the Aaronic Priesthood in his ward. He said he gave them the “standard pep talk,” showed slides and souvenirs, and shared his testimony. He mentioned to the young men that they needed to be prepared for the realities of missionary life. They might get called, for example, to a place where living conditions are poor and missionaries are often sick; or they might end up where Americans or Mormons are disliked. He didn’t go into detail, but he thought the boys should know his mission wasn’t easy. After the meeting, a red-faced bishop took him aside and reprimanded him for sharing the “negative” aspects of his mission: “We are trying to encourage these young men to serve missions, and after listening to you they may not be as eager to go.” My friend was shocked by the bishop’s reaction, and he said he was consciously much less candid afterwards. He began to self-censor. Another missionary reported, “I learned quickly that being candid about my mission only got me scorned.” When I published my book, several family members expressed concern that it was “too negative” despite my best efforts to present what happened without comment and in a balanced, honest way. One reviewer reacted angrily to my book, saying that I was attacking the LDS church and setting myself up as the hero against the cold, uncaring church. He also said that his mission (also to Bolivia) was nothing like what I described in the book. I asked him if he had read the book; he hadn’t (Personal correspondence, Dec. 2011). My guess is that the hostility comes because, by speaking openly about missionary life, we are violating a social taboo and running counter to cultural expectations. Missions are rites of passage for young Mormons, particularly young male Mormons. Parents tell themselves that if they can just get their sons on missions they will stop worrying about when—or whether—their boys will grow up. Missionaries are supposed to learn how to become men on their missions and return home wiser, more focused, and far more mature. But is that necessarily true? Once I stood in a Bolivian airport watching a large group of American missionaries board the plane for home. Getting all of them to the airport and on the plane had been a nightmare for me, the travel secretary, because several of them had left their companions a couple of weeks early and were doing “road trips” to visit girlfriends and participate in other activities not normally associated with missionaries. Watching them cross the tarmac, I realized that they would all go home and give the same general homecoming talk and impress everyone with their maturity and spirituality. Their families and wards would not have any idea which missionaries had been hard-working and faithful, and which had not, as long as they met expectations. The problem is, not only is the mission experience whitewashed, [but] missionaries are a significant part of the problem and are unaware that they are doing the whitewashing. I think a good share of this is sub-conscious; since it is supposed to be “the best two years” of your life, then that’s the way you play it. Your parents, family, ward, and everybody back home are expecting it, so you give them what they want. It’s not just other people’s expectations that we are fulfilling; we also expect certain things of ourselves. One young man noted, “All you ever hear is that it’s the best 2 years of your life – so when it’s not, you still feel like you need to keep up the charade.” Another spoke of expending “a lot of energy aimed at keeping an illusion alive in your mind and in the minds of others [who] want to believe it as bad as you do.” We may convince ourselves that our mission really was the way we described it and we really have grown up. Closely related to the need to meet expectations is the need not to cause disappointment or embarrassment to your family and friends. When missionaries come home early for reasons other than health, often they and their families feel a lot of shame that their son or daughter has not “returned with honor.” No one wants to bring shame to themselves and their families, and keeping up appearances ensures that won’t happen. I corresponded for quite some time with a young elder who had decided that, even though he was miserable and was pretty sure he didn’t believe in the church, he would rather spend another year in South America faking his way through a mission than let his family down. When I asked him what he would do when he got home, he said he would go off to college and quietly fade into inactivity because that would be easier on his family. I think that we were implicitly encouraged to be positive in our letters home to our families, so as not to worry them, and to provide a positive image of striving to do our best to serve the Lord. On the mission, all of us from the same MTC district kept in fairly close touch. It seemed like there was an unspoken rule that it was OK to discuss the negatives with your buddies because they were going through the same thing. So we did talk about lame companions, blessings that didn’t work, lame membership, bad missionaries, missionaries getting sent home, hot sister missionaries, hot investigators in cities we were in, egotistical missionary leaders, etc., amongst ourselves, but none of this information ever made it in letters home, nor was it discussed post-mission. As I mentioned, my journal entries are pretty blunt, but several respondents mentioned censoring their journals so as not to disappoint those who might read their words later. I kept a journal on my mission, and even though I was miserable most of the time, I still only wrote positive experiences in it. I was afraid someone else would read it and be disappointed in me. … I gave my return talk then rarely spoke about it again. I also remember being told to put only positive things in our journals, because one day our progeny would read them. I actually tore pages out of my journal because although they were true, they weren’t useful or faith-promoting. Somehow we forced our experiences into the faith-promoting template and left everything else out, almost as a way to protect ourselves from the disappointment and disapproval of others. My wife was talking the other day about what she might have done to help our kids keep their testimonies. She wondered if maybe she should have talked more about her mission. I had to remind her that the reason she never tells them anything about her mission is because it was a horrible experience. She agreed. Again, it’s not that all missions are “horrible” but that they are seen as tools for strengthening others’ testimonies and encouraging them to serve on missions. For this sister, it seems that remaining silent was the best way for her to set an example. I also think it’s an extension of a problem with the church in general –if there’s something wrong with your church experience, the problem is with you, not the church. I saw that others who had returned from their missions had had “amazing” experiences. It never occurred to me that they might be lying, exaggerating, or leaving out the naughty or bad bits. So, I kept wondering when I was going to have these amazing experiences. I think I kept trying to transform my explanations of the experiences I did have into something more amazing than they really were. I was trying to transfigure simple stories post hoc into mythic stories. In addition to the explicit instruction, I think there is social/cultural pressure to keep it positive. The first half of my mission was terrible. … I put myself in a continual state of punishment [and] guilt for minor indiscretions (i.e., microscopic) I had done years ago. … I couldn’t forgive myself and move on because the MTC was just a pressure-cooker for guilt. It was like 12 months of psychological warfare on myself. But once I finally moved past it and got home, I felt the need to always spin the mission in a positive light. Maybe part of it is subconscious because you want to validate the experience in your own eyes and not see it as a waste. I felt pressure as a sister missionary to stay positive and show that I could be just as good a missionary as the boys were. I heard so many negative stories about sister missionaries, how they never got along with each other, how they were only there because no one would marry them (only in Mormondom is a girl an old maid at 21!). So I never, ever wrote home about any of my companions’ craziness, and I really talked up the ones I actually felt close to. I didn’t tell my parents about some serious health problems I was having because I didn’t want to seem weak. I constantly talked about how much I loved the work and the amazing experiences I was having, even though a lot of the time I was questioning the tactics and feeling discouraged about the lack of success. When I got home, I perfected the art of creating inspiring stories and object lessons out of rather mundane experiences. Perhaps creating inspiration from the mundane is a way to reassure ourselves that we were part of something bigger and grander than ourselves. I’m pretty sure that’s how I spoke of my mission: as a tough, grueling experience that brought great blessings and helped me learn to overcome adversity. That is probably true in many respects, and I would imagine it is for most missionaries. But somehow, I never felt like what really happened was a good enough story to tell. What is the price we pay for shading the truth and discarding the unpleasant or difficult? Many respondents said that they had sugarcoated their missions so much that they had lost sight of what had really happened. For some, the stories they told and they records they kept were “twisted [so] positively” that they felt their journals had crossed into fiction: “If people were to read my journal they wouldn’t have a clue about how tough it really was. … Basically my history as recorded in my journals is completely biased. I should probably go out and destroy them for this very reason.” Several respondents mentioned that rereading their missionary journals gave them a sense of loss, that they had lost memories of their past in favor of the sanitized history they put in writing. The drive not to disappoint ironically had defeated the purpose of keeping a journal in the first place. I don’t want to rehash the bad experiences, but I told a friend of mine about [a less-than inspiring incident] after my mission. He nearly started to cry, because he had been home over a year and had been holding in all the negative feelings he’d had. The trauma of the mission had been compounded by the compulsion to keep silent and pretend that not only did it not happen, but that it was an unmitigated positive experience. The inability of RMs to work through the crap they put up with makes them mission an even more damaging experience. It’s never a good idea to keep your feelings inside, and yet that is the situation we put our missionaries in because of explicit and implicit rules against candidness. What can we do to change this situation? Realistically, the church is not going to change its approach to missions, and it is not up to me to tell them what I think they should do. So, I’m going to limit my suggestions to things that parents and families can do. Talk to your children about what to expect realistically from a mission. Yes, you can tell them what a great experience it can be and encourage them to go, but they need to know what to expect. At this point in the church’s history, the vast majority of young men and women serving missions will have at least one parent who served a mission (in my family it’s both parents). I am certain that there are things you wish you had known before your mission that you could share with your kids. Encourage them to communicate in their letters home. Ask specific questions, and let them know that it’s OK to be brutally honest. If my parents had been there for me to talk to—honestly and nonjudgmentally—they would have been much more of a support to me. They sent me encouragement and care packages, but I never really shared my mission with them, and we all lost out. Have them spend an hour with a counselor or therapist as part of their re-entry into normal life. Every missionary is required to have a physical exam by a doctor when they get home, but no one thinks to ask about their emotional or mental health. Most missionaries will come home just fine, but having a safe place to talk about things, even for just an hour, could do wonders. And of course, such an exit exam might help families spot problems before they get serious. I believe that a mission can and should be a wonderful, life-changing experience for young LDS men and women, but we must approach missions with honesty and candor. Our children deserve at least that from us. My interview with City Weekly is out now. As I predicted, I’m being told I’m bitter and angry. No matter. I said what I wanted to say, whether people agree with me or not. It’s kind of a surreal experience, as my name and face have never been in print other than in a school yearbook. But I figured I couldn’t turn down the invitation, and I’m happy with the way it turned out. And just so there’s no confusion: I did not leave the LDS church because of Joseph Smith’s practice of polygamy and polyandry. That would be way too simplistic. Over many years I rationalized and “shelved” problematic issues, not only in church history but in LDS scripture and foundational claims. The incident with my friend was one of those moments of clarity when I realized how much I had been rationalizing, and I couldn’t justify it anymore. Once I stopped rationalizing polygamy and polyandry, every other rationalization went, too. 10. Have a massive clearance sale at City Creek just for Swedes. 9. Purchase SAAB’s assets and give every member a new car for every year they attend meetings and pay tithing. 8. Tell them that masturbation is no longer sin, and hopefully they’ll be so distracted they won’t notice the truth. 7. Send special “minder” couple missionaries to watch over them and make sure they aren’t exposed to “unworthy” information. 4. Provide free membership to Dieter Uchtdorf’s tanning salon. 3. Two words: Reparative Therapy. 2. Give members a choice between attending church or being forced to read “Thomas Monson: To the Rescue” over and over. 1. Teach the truth about the church’s history and truth claims. Oh, wait, what was I thinking? It’s amazing how the Lord’s true prophet and church could be so persecuted. After all, the mark of the true church is that its members will be persecuted and its prophet martyred. After the Saints had gathered into one place to build a Zion society with their prophet, neighboring Gentiles vexed the prophet with criminal charges and lawsuits. A disgruntled former counselor in the First Presidency published lurid tales of polygamy and debauchery, which inflamed the Gentiles to anger. At one point the prophet was arrested for treason. Undaunted by opposition, he ran for high political office, facing strenuous opposition. Eventually the prophet was gunned down in cold blood. His murderers went through the formality of a mock trial but were not brought to justice. After the prophet’s assassination, mobs of Gentiles began attacking the Saints. Soon they drove the innocent Saints from their homes and plundered the city they had built. Because the prophet was unclear about his successor, there was great confusion about who would be the next prophet. After a power struggle, the leading apostle of the church assumed the leadership of the church. A large faction refused to follow the new leader and eventually formed the RLDS church. Of course, this great prophet I speak of was James J. Strang, who gathered his followers to Beaver Island, Michigan. I have shared my nonbelief with the people who matter: my immediate family and close friends. I figure that it’s no one else’s business, so I only tell people when they ask. Next week, City Weekly will be publishing an interview with me, and I’m pretty sure my apostate status will become public knowledge. It actually feels good to just get it all out on the table. I haven’t decided who I’m going to vote for this fall. I’ll probably get a lot of grief from this, but I’m really dismayed at the petty attacks from the Obama campaign on Romney’s record at Bain Capital. 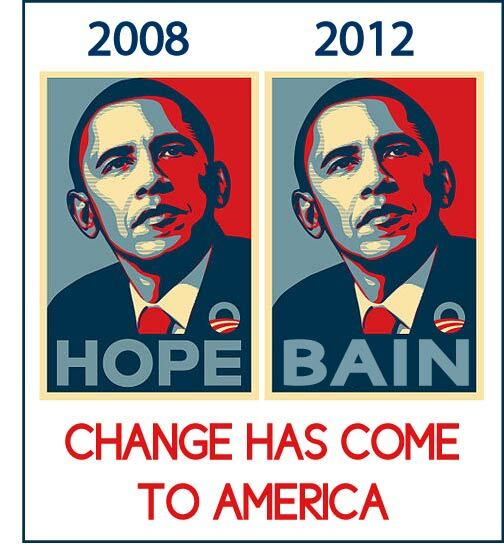 Our country is in deep trouble right now, and all they can do is flail away at when Romney officially left Bain. It’s shameful. I want to know what each person plans to do for the country, not whether Romney was still legally involved with Bain while he was working for the Olympics. So, here’s something I whipped up this morning. After watching for a few years, I understand that what motivates much of Mormon apologetics and “defense of Mormonism” efforts is fear. The worst fear is that Mormonism might not be true, after all, and that it might be obviously untrue to those who look at it objectively. It’s a terrifying thought to contemplate that the “knowledge” by which you organize and live your life might actually be a lie, that you have given so much of yourself for a manmade institution, that your spiritual confirmation of Mormonism might not have been anything spiritual at all. When you’re afraid you do funny things like see everything in black and white, good and evil, and you carefully draw lines between yourself and the evil around you. You see those who disagree with you not just as opponents but as enemies to be destroyed lest they destroy you. You adopt an exaggerated, overwrought, outward image of certainty, but inside you’re just a scared child. This is the only way to explain the bizarre antics of so many apologists from an apostle who warns that “some things that are true are not very useful” to university professors who fake photos to self-professed cleaners of the temple who decide for themselves who is faithful and who is not. People who aren’t afraid stand out because they are comfortable in their own skin, they aren’t threatened by different points of view, and acknowledge that their understanding is always limited, so they could be wrong. That’s the key: Don’t be afraid to be wrong. Often we learn best by discovering we were wrong in our earlier understanding. To insist that what we believe is true, full stop, is to stop learning and growing. You are currently browsing the Runtu's Rincón blog archives for July, 2012.